FAQs: Your Sunscreen Questions. Our Answers. Sunscreens: How it Works, What it Means. Which sunscreens are best and why? Is a good sunscreen all I need to be safe? Doesn’t the government ensure that sunscreens protect us? How much sunscreen is enough and how often should I reapply? Will sunscreen protect me from cancer and wrinkling? How high an SPF should I use? Has using sunscreens lowered skin cancer rates? Why shouldn’t I use sunscreen sprays and powders? What about products that combine sunscreen with bug repellent? I am using a good quality sunscreen with SPF 50, so why do I still get burned? How do you remove sunscreen? What should I do to protect my pet from the sun? An ideal sunscreen would block the majority of UVA and UVB rays with active ingredients that do not break down in the sun, so that the product remains effective. It would also contain only active and inactive ingredients that are proven to be completely safe for both adults and children. No sunscreen on the U.S. market meets all these criteria and consumers have no simple way to know how well a given product stacks up. 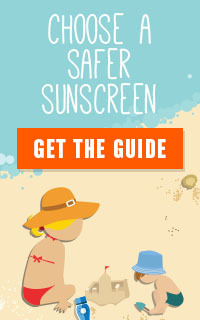 That’s why EWG created this guide to safer and more effective sunscreens. No. Sunscreens can only provide partial protection against the harmful effects of the sun. Limiting sun exposure and wearing protective clothing are more important for protecting your skin from cancer and premature aging. Be extra careful about spending time in the sun between 10 a.m. and 4 p.m., when the sun’s rays are most intense. And remember that UVA radiation doesn’t decline as much as UVB when the sun is lower in the sky or it’s overcast. UVA rays can even penetrate glass. Apply sunscreen generously 30 minutes before going outside and reapply it often – at least every two hours. Even the best sunscreen won’t work well if you don’t use it correctly. No. 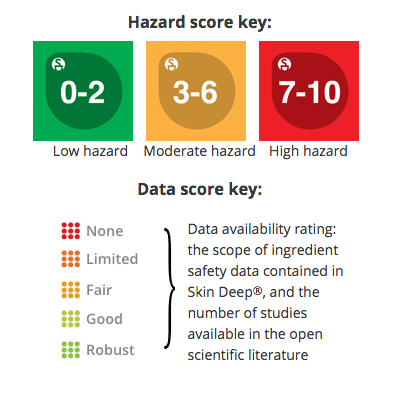 After a 34-year process of reviewing sunscreen safety and efficacy, the U.S. Food and Drug Administration implemented enforceable rules on sunscreen marketing and UVA protection. The FDA allows American sunscreen makers to claim their products are “broad spectrum,” even though many offer much poorer UVA protection than sunscreens sold in other countries. Based on the products in our 2018 database, EWG estimates that half of all beach and sport sunscreens could not be sold in Europe because they provide inadequate UVA protection. Manufacturers there voluntarily comply with a European Commission recommendation that all sunscreens provide meaningful UVA protection in relation to SPF. FDA rules do not bar products with sky-high SPFs that prevent sunburn but leave users at risk of UVA-related skin damage. The agency currently allows sales of spray sunscreens that can be harmful when inhaled, but is investigating their safety. The FDA has barred powder sunscreens. Since kids are more vulnerable to damage caused by the sun and to the harmful effects of chemical exposure, they should use a sunscreen rated highly for safety and effective protection from UVA and UVB radiation. If your child plans to swim and play in the water, look for a water-resistant sunscreen, but don’t believe any claim that a sunscreen is water-repellent. Don’t buy sprays or products with bug repellent. Apply sunscreen generously before children go outside, and reapply it often. Infants under six months need special protection – a fair-skinned baby does not yet have protective melanin proteins and needs to be kept out of the sun. The American Academy of Pediatrics recommends that you avoid using sunscreens on children younger than six months unless you can’t find protective shade and clothing. In that situation you can apply a minimal amount of sunscreen to exposed skin (AAP 2008). Sunscreen is just one part of a sun-healthy lifestyle. Limiting sun exposure and wearing protective clothing are more important. Follow the advice of the American Cancer Society and put on sunscreen early, regularly and generously. Apply it 30 minutes before going outside and at least every two hours thereafter. Reapply it after being in the water, sweating a lot or towel drying, since all of these activities can remove sunscreen. (One study indicates that it’s best to reapply your sunscreen after the first 15 to 30 minutes in the sun.) Don’t skimp on sunscreen. Studies have shown that people typically apply only one-fourth to two-thirds of the amount required to achieve the product’s SPF rating. The American Academy of Dermatology recommends applying one ounce — about a palm-full – evenly to all exposed skin. The principle forms of ultraviolet radiation – UVA and UVB – are known to contribute to skin cancer, wrinkling and skin aging. To get the most protection, use a product that filters out a significant proportion of both types. All sunscreens protect against UVB rays, but only some protect against UVA. Many American sunscreens bear labels that boast “broad spectrum” protection, but their UVA protection is often inadequate. You can tell how effectively a particular sunscreen protects skin from sunburn by the SPF number – the higher the number, the stronger the protection. But SPF values tell you little about UVA protection. The FDA’s rules for broad-spectrum sunscreens are too weak. In 2017, EWG estimated that 99 percent of all sunscreens on the market could legally use the “broad spectrum” label even though many provide inadequate UVA protection. There are critical differences among sunscreens, but you can’t find out enough just by reading the label. This is one of the primary reasons EWG created its sunscreen guide – to give consumers much-needed information about how effectively their sunscreen blocks both types of harmful radiation. Starting in 2013, products that met the broad spectrum standard were allowed to make this claim: “If used as directed with other sun protection measures (see Directions), decreases the risk of skin cancer and early aging caused by the sun” (FDA 2011a). SPF measures protection against sunburn, which is primarily caused by UVB rays. If your skin would normally burn after 10 minutes in the summer midday sun, for example, wearing a thick layer of an SPF 15 sunscreen would theoretically allow you to stay in the sun for 150 minutes (10 x 15) without burning. That’s only a rough estimate. Skin type, the nature of your activities in the sun (e.g., whether they involve water or sweat) and the intensity of sunlight may affect how much safety it gives you. But SPF ratings can be confusing or misleading. People rarely apply enough sunscreen to achieve the labeled SPF. The numbers do not reflect UVA protection. The FDA has warned that high-SPF products can create a false sense of security, contain higher concentrations of allergenic or irritating ingredients, and offer little additional sun protection (Branna 2011). Pick the SPF appropriate for your skin type and expected time in the sun. UVA protection in American sunscreens maxes out at about 15 to 20. Higher SPF products will not offer proportionally higher protection. The American Cancer Society recommends that people use a sunscreen with an SPF of at least 15, while the American Academy of Dermatology opts for 30. 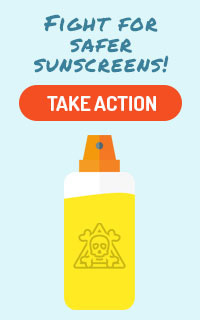 EWG recommends that you avoid sunscreens with SPF numbers higher than 50. More important than ultra-high SPF numbers is applying sunscreen generously. Most people put on only one quarter to two-thirds as much as it takes to achieve the product’s SPF rating (Diaz 2012, Grosick 2004). The active ingredients in sunscreens absorb, reflect or scatter ultraviolet radiation, changing the skin’s response to sunlight. Sunscreens typically contain a combination of chemicals known to be effective for certain wavelengths of UV light. Some chemicals work better than others, as do some combinations of active ingredients. For years, manufacturers created sunscreens that were only effective at screening out UVB radiation – the type of rays that cause sunburn and increase the risk of skin cancer. More recently, scientists realized that UVA radiation is also harmful, so sunscreen manufacturers have attempted to create sunscreens that protect skin from both UVB and UVA radiation. Many American sunscreens lack strong UVA protection, due to restrictions and weak rules on available ingredients. Controlled studies comparing sunscreen users with non-users find that sunscreens reduce the risk of squamous cell carcinoma, but not basal cell carcinoma. The evidence on melanoma, the most dangerous skin cancer, is mixed. Despite greater sunscreen use and sun awareness, the rates of new melanoma cases among American men, women and children continue to climb. Most experts recommend that people use sunscreen but do not rely on it exclusively to prevent sun damage (NCI 2007, van der Pols 2006, Green 1999). 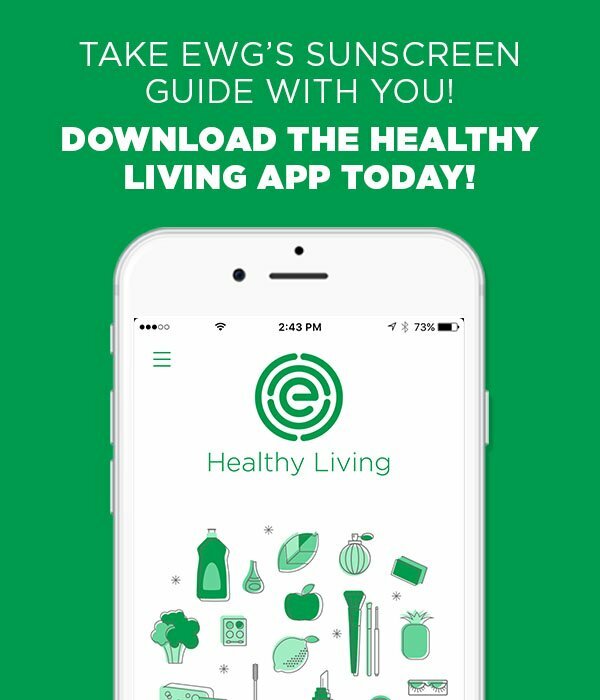 EWG does not recommend powder and spray sunscreens because of concerns about inhalation and inadequate sun protection. The FDA is reviewing safety and efficacy data on sprays. In its 2011 sunscreen rules, implemented in December 2012, the agency decided that powdered sunscreens should no longer be sold under the current over-the-counter sunscreen rules and should be subject to the more rigorous new drug application process (FDA 2011a, 2011b). EWG is especially concerned about inhalation of nano-sized and micronized zinc and titanium in powdered sunscreens and makeup products. Inhalation is a much more direct route of exposure to these compounds than skin penetration, which appears to be low in healthy skin. If you want the benefits of a mineral sunscreen, choose a zinc- or titanium-based lotion. If you use a pump or spray sunscreen, lower your inhalation risk by applying it to your hands and then wiping it on your face. EWG recommends against using them. For starters, bugs may not be a problem during the hours that UV exposure peaks. Also, you may need to reapply sunscreen more frequently than bug repellent, or vice versa. It’s wise to avoid using repellent chemicals on your face. Most worrisome of all, sunscreens often contain penetration enhancers, which help chemicals soak into the skin. Studies indicate that concurrent use of sunscreens and pesticides leads to increased skin absorption of pesticides (Wang 2006, Wang 2007). The FDA is studying the safety of sunscreens with insect repellents and is considering new labeling requirements, but it hasn’t reached a conclusion. With proper use of an SPF 30 sunscreen, theoretically, you should be able to endure 30 times more sun exposure before burning than if you were not wearing sunscreen. Proper use means that you apply sunscreen 20 to 30 minutes before being exposed to the sun, you apply about one ounce or more over your entire body (that’s more than you think!) and you reapply it frequently. Reapply every two hours and after swimming, sweating or toweling off. Many studies show that consumers apply only a quarter to half the recommended amount of lotion. That means that an SPF 50 product will act more like SPF 7, and you are more likely to come home from the beach with a sunburn. Chemical-based sunscreens will break down in the sun and lose their effectiveness over time. Normal swimming, toweling and sweating will also remove sunscreen. At the end of the day, warm water and soap are best for getting sunscreen off your skin. Animals can get sunburned and even get skin cancer, especially where they don’t have fur or hair. Avoiding peak sun intensity between 10 a.m. and 4 p.m. is the best strategy. The American Animal Hospital Association cautions that only fragrance-free, pet-specific sun products should be used on animals. Grooming behaviors put cats at greater risk of swallowing harmful ingredients in sunscreens (Rainey 2009). EWG recommends that consumers avoid sunscreen with vitamin A, also called “retinyl palmitate” on the label. Data from a study by scientists at the FDA and the National Toxicology Panel (NTP 2012) showed that retinyl palmitate may speed the growth of skin tumors when applied to skin in the presence of sunlight. The German and Norwegian governments have warned that many people are exposed to excessive amounts of vitamin A and that personal care products contribute to this problem. People who want to limit their exposure to vitamin A should avoid retinyl palmitate, retinoic acid, retinyl lineolate and retinyl acetate in sunscreens, lotions, lip products and other leave-on cosmetics until more information is available about their safety on skin.